I have always loved starfish, sand dollars, shells, coral and all other sea decorations. Something I never liked though was the coral pink and seafoam green beach decor of the 1970’s. Unfortunately for me, the bathroom in my house is a combination of the decor I loathe with a Victorian twist. Yuk. We’ve already begun peeling ancient wallpaper and have primed the green cabinets, but we have soooo much more work to do and not enough money to do it with. So in the meantime I’ll be adding some beachy type touches as I work my way through this long, drawn out remodeling adventure. Note: Please ignore the chippy look of my wall above the tile in the first photo. We are in the process of removing some very old and very sticky wallpaper! I was flipping through my Pottery Barn catalog when I came across this picture. 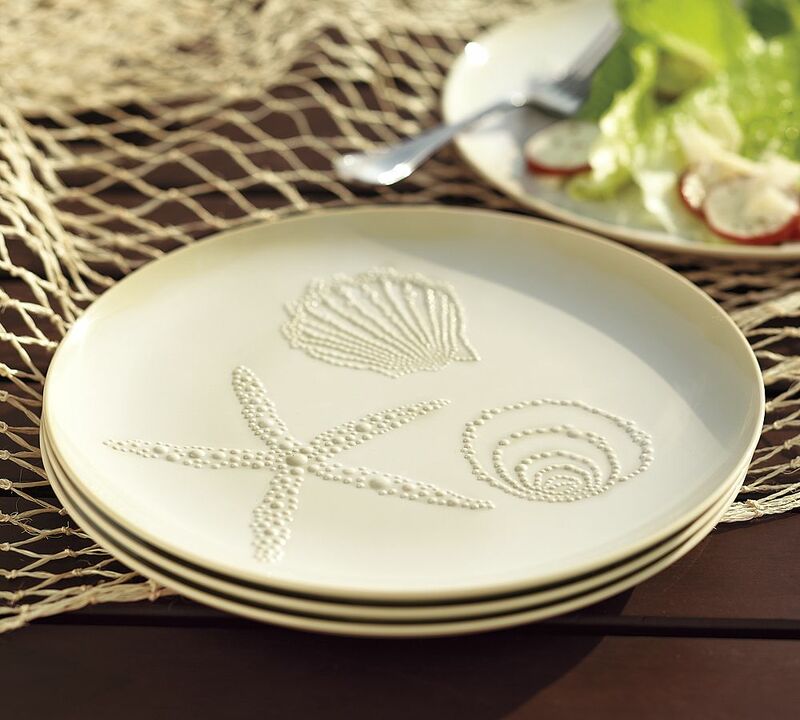 It’s for their Shell Melamine Salad Plates. I immediately fell in love with the design of the starfish I knew I could recreate it somehow. I found this. It’s a crudely cut lid for a 5 gallon plastic bucket. More specifically an ice fishing bait bucket. The lid was used to not only protect the live bait from the elements, but also served as a seat for the fisherman. I’ve been hanging on to this for quite some time. Here’s what I used to create this project. For the base I used Americana Bleached Sand with a few touched of Spa Blue. I used some Raw Umber mixed with Staining/Antiquing medium, then used Americana Desert Sand mixed with an equal amount of Thickening Medium to create the 3D starfish. Finally, I dry brushed on some Americana Cocoa. First I sanded the entire surface and sides of the wood using my beloved Ryobi hand sander . Then I dusted it off with a soft brush. Thickening medium allows your acrylic paint to behave a little more like oil paints in that they don’t dry as quickly and the shape can not only be manipulated, but will also hold up better. I let it dry overnight, then dry brushed some cocoa carefully over the starfish to make it a little darker and make it look a bit sandy. I love the way it turned out and can’t wait to get everything else in my bathroom done! Amanda! Can I just hire you to make all kinds of goodies for my house? I LOVE your ideas. Truly love them! Love this! 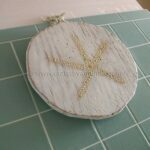 a very cute project and so beachy. Thanks for the tutorial! Looks absolutely perfect with the tile. Great job. I love it Amanda. Perfect for your new bathroom. I found you through MET Monday! Great great job! Really pretty! This would be a great addition to a beach cottage. Also – gave you a vote!